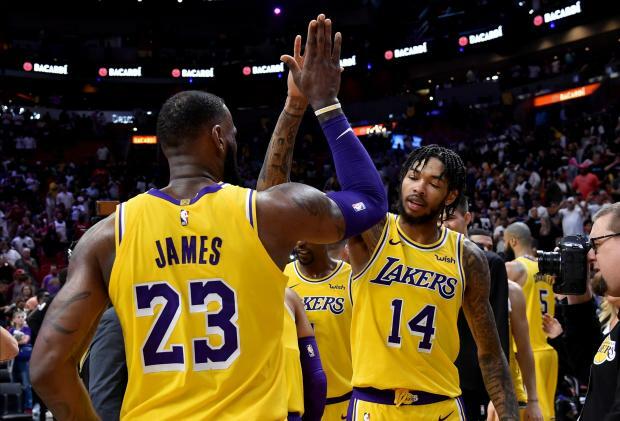 LeBron James scored a season-high 51 points as the Los Angeles Lakers defeated the host Miami Heat 113-97 on Sunday night. James, who won four Eastern Conference titles and two NBA championships in four years with Miami, made 19 of 31 shots from the floor, including 6 of 8 3-point attempts. He added eight rebounds, three assists, two steals and one block while making 7 of 10 free throws. He set the record for most points scored by a Lakers player against Miami. In addition, the Lakers were plus-20 during James' 38 minutes on the court. James had 19 points in the first quarter, 28 points at halftime and 42 through three quarters. Wayne Ellington led Miami with 19 points, and Josh Richardson and Tyler Johnson added 17 points each. However, Richardson was upset with the officiating and was ejected from the game in the fourth quarter after throwing one of his sneakers into the crowd. Heat coach Erik Spoelstra, in support of Richardson, also got hit with a technical foul. LaMarcus Aldridge poured in 24 points and grabbed 18 rebounds, and DeMar DeRozan added 20 points, including five in the final three minutes, as San Antonio Spurs defeated visiting Golden State. San Antonio led just 91-90 after a 3-pointer by Klay Thompson with 3:38 to play before the Spurs forged a 6-0 run off a basket by DeRozan, a baseline jumper from Aldridge -- who followed with a huge blocked shot on the other end -- and two free throws from DeRozan that all but finished off the defending NBA champs. Rudy Gay added 19 points, 15 of them in the first half, for the Spurs, who snapped a three-game losing streak and won for just the second time in seven outings. Marco Belinelli and Bryn Forbes scored 12 and 10 points, respectively, for San Antonio. Kevin Durant led all scorers with 26 points while Thompson added 25 and Quinn Cook tallied 16 for Golden State. Marc Gasol scored 26 points, grabbed 13 rebounds and made four 3-point shots to lead Memphis to a road win against Minnesota in Minneapolis. Mike Conley added 18 points and eight assists for the Grizzlies, who have won five of six. The Timberwolves had won three straight since trading Jimmy Butler to the Philadelphia 76ers. Reserve guard Derrick Rose kept the Timberwolves in the game, scoring 18. Rose was 6 of 11 from the field, including 2-for-4 from long range. Newly acquired Dario Saric also gave Minnesota a lift off the bench, scoring 14 points. Damian Lillard scored 40 points and CJ McCollum added 25 as visiting Portland held on to defeat Washington. Portland led by as many as 29 points in the third quarter as Lillard poured in 19 of his points in the quarter, but the Wizards went on a 10-2 run to pull within 91-70 to start the fourth. The Trail Blazers pushed the lead to 25 on a Nik Stauskas 3-pointer early in the fourth. Washington's reserves closed strong against the Portland starters, and the Trail Blazers' lead shrank to as few as eight points in the final minute after Kelly Oubre's three-point play. John Wall topped Washington with 24 points. Orlando rolled to its third consecutive victory, never trailing visiting New York. Six players scored in double figures for the Magic, led by Aaron Gordon with a season-high 31 points. Orlando saw its 18-point, first-quarter lead shrink to just one at halftime, but the Magic scored the first six points of the third and were able to hang on for the remainder of the game. Nikola Vucevic narrowly missed out on a triple-double, finishing with 28 points, 10 rebounds and nine assists, and Evan Fournier added 19 points. Tim Hardaway Jr. scored 32 points and Trey Burke added 31 for the Knicks, who have lost five straight.